This little mini is comprised of some of my favorite Cotton + Steel prints, ranging from the Basics lines to Mustang to Playful, plus a little dash of one of my favorite Rashida Coleman-Hale collections, Koi, which plays all kinds of perfectly with Cotton + Steel! There are three main block repeats used in the pattern, the main star block in the center, with small pluses and x's surrounding it. It's a very simple little quilt to put together, and great for using up the last scraps of some of your favorite fabrics! The X and Plus blocks that surround the center star were quite literally inspired by my love for the X and + block, which is still one of those blocks that's on my To Do list. I had wanted to try to do a mini version of those blocks as the border for this mini, but decided that in the small size that they would be just too busy and that I needed something more simple for a small block. I just finished up my last Pay It Forward (PIF) project, so combining that with the big destash I did on Instagram yesterday, I'm going to be spending the next day or so packing stuff for the post office. I'm excited to see what everyone thinks of their packages, I hope they'll enjoy them! This last project uses negative space as a main design element. I love quilts with lots of negative space, but I also love block-based quilts, but in looking through my work, I haven't really done many quilts with lots of negative space, so I really wanted to work on something small with lots of negative space. I've got another negative space project going at the moment, but I'll share some progress on that one next week. Stars a big obsession for me right now (I think the Lucky Stars Block of the Month club is a big indicator of that! ), and I'm pretty sure my PIF person that I made this for is a big fan of stars as well. I've been sorting through my fabric a lot these last few weeks, taking out pieces that I wanted to destash, and I came across a piece of Lizzy House's Constellations and inspiration struck. Floating stars! 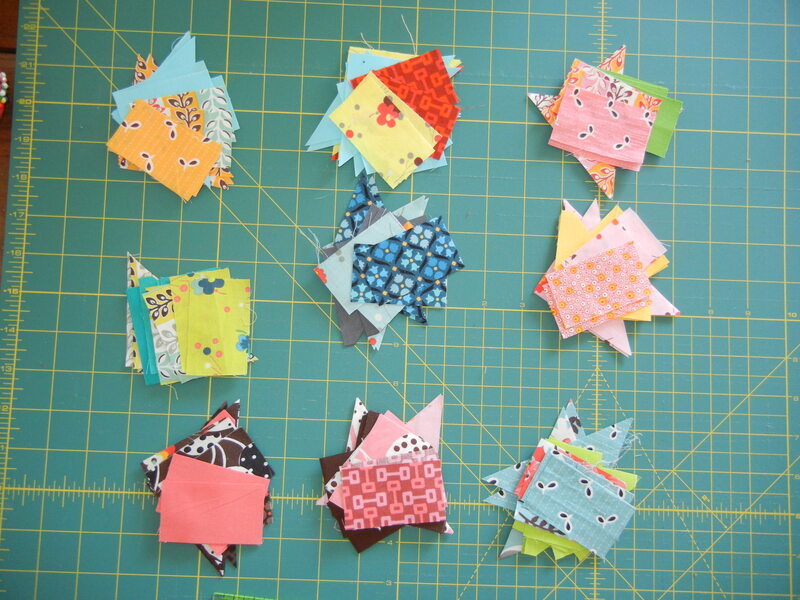 So I started working on some EPP stars, using different shapes, to place on a sea of Constellations. I'm really happy with how this turned out, from the simple but effective quilting to the matchy-matchy binding - I love that effect on minis - and I hope that it will be well loved. 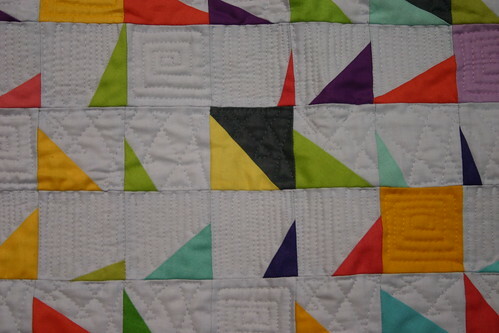 There are two simple hanging triangles on the back of the quilt so that it can be hung with ease. fabrics: from my scrap bin! How on Earth is it Monday already??? Is it just me, or is this month just flying by?! Fortunately, it's been a good sewing month, and I have a fun finished mini to share with you all this morning. Last week, I went a little crazy with my solids scrap bin. I wanted to make a little something that I could finish, so I opted to make a little mini, using various squares. After laying them out on my design wall, I thought they just looked too plain, so I decided to do some wonky stitching-and-flipping to spice it up a bit. After I finished my squares and started putting them up on my design wall, I fretted. Chaotic would be a serious understatement. I posted this work in progress on both Instagram and Facebook, and got tons of feedback, including a great idea from Amanda (who also happens to have a lovely fabric shop! ): add in some solid squares to give the eye a place to rest. For once, I decided to match the threads to the fabrics I was quilting on top of. This was a little bit time-consuming to actually pull off because of how many different colors I was using, but I really love how it looks. Even if I did utter a few sailor-quality curses as I buried the threads! 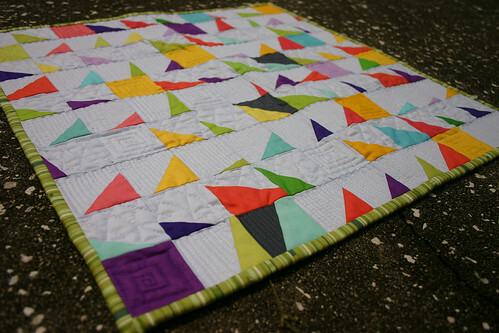 I also decided to do a couple of different quilting styles, which made the whole thing a lot of fun. 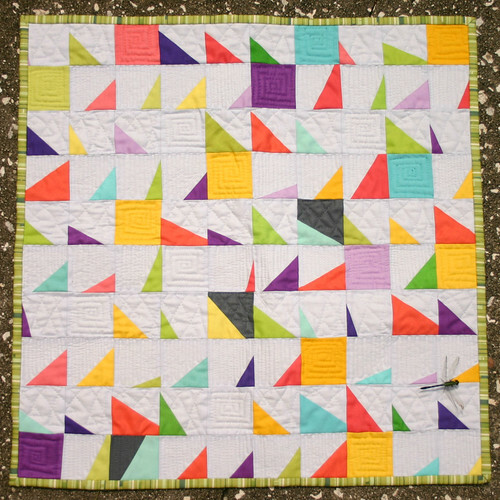 There's a continuous square-in-a-square type of quilting in the solid squares, and then the remaining wonky stitch-and-flip squares are quilted in rows, alternating between a sound wave style of quilting and a continuous triangle kind of quilting. To finish it off, I bound this little guy with a fun Nicey Jane stripe that I just love, and I really love how it almost adds more chaos to this little quilt. This quilt is going to make a fabulous addition to my wall of miniquilts, and it just makes me smile every time I see it! note: the dragonfly is real, not part of the quilt! Thanks for all the well wishes the past few days, everyone, I really appreciate it. I'm still trying to get over this darned cold, but I hope I'm going to kick it to the curb real soon. 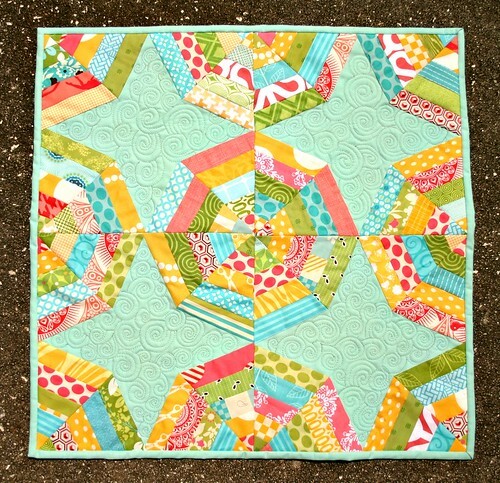 Today, I'm super excited to share my little mini for Amy's awesome Sew and Tell Mini Quilt Challenge. 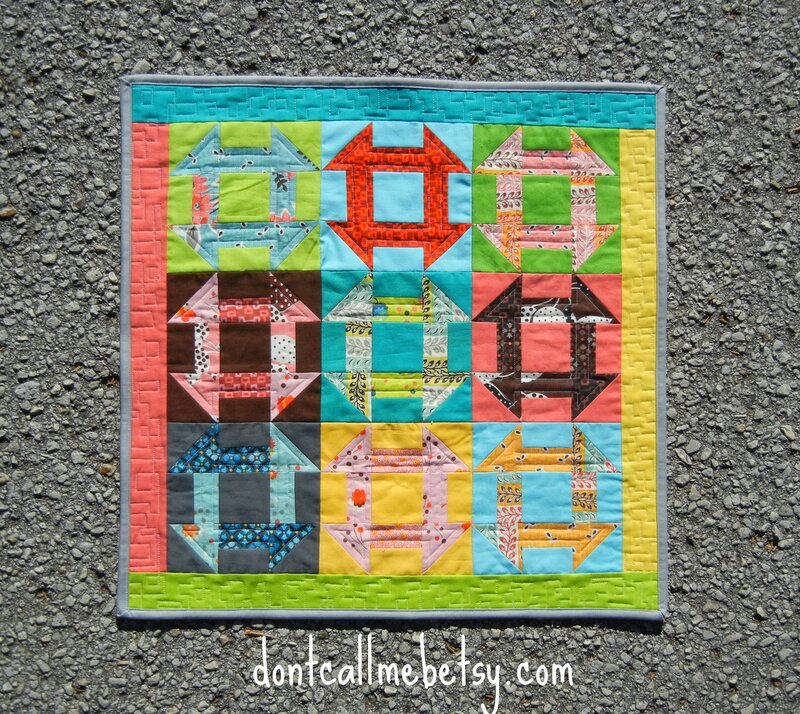 Not too long ago, another fabulous quilty Amy posted a new churn dash quilt she'd finished, and I was surprised at how much I liked it. 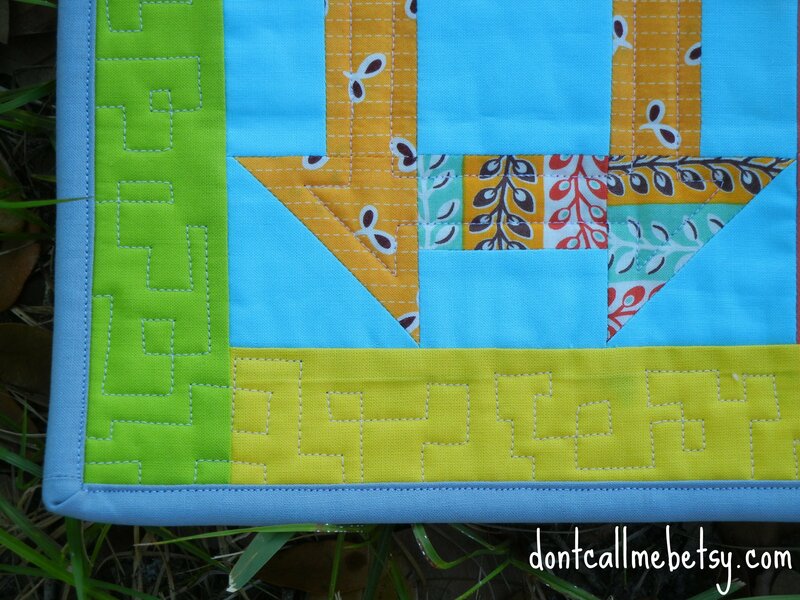 I do like traditional blocks, but I haven't ever seen a churn dash quilt I liked...until Amy's. I just loved the simplicity of it, and I thought it would look good in a teeny tiny size, so I did the math for some 6" blocks and got to cutting. 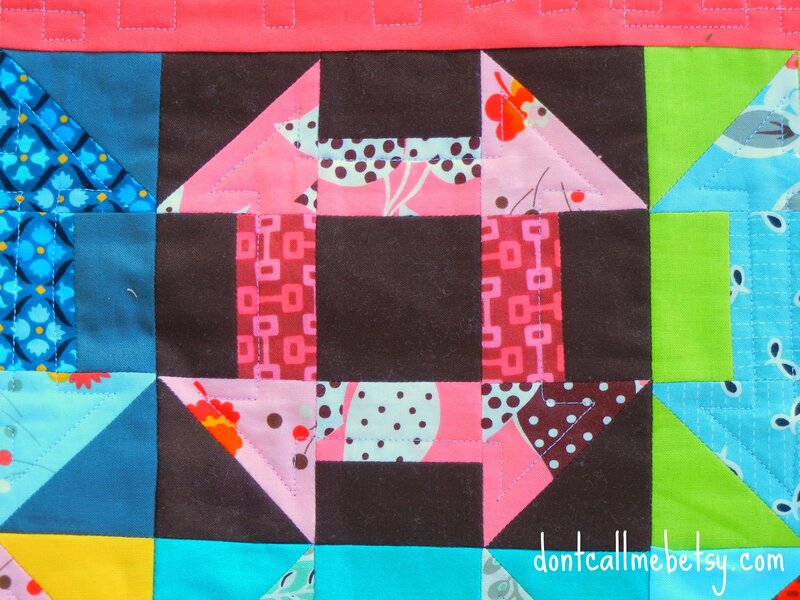 These blocks came together awfully quickly, then I decided to add a fun border for an additional pop of color. I added some DS Fairgrounds for the backing, and set about to quilting. 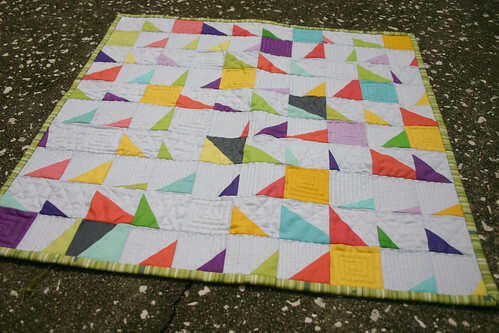 I was seriously indecisive about my quilting, and that's why you'll see two different kinds of quilting on this quilt. In the border, I went with a puzzle-piece kind of straight-line quilting which was a lot of fun, though I can't imagine doing it on a large quilt. I then added some echo quilting inside each print of my blocks for some extra depth. My best friend is having a birthday this weekend. I knew exactly what I wanted to make for her birthday, but what I didn't account for was that my munchkin saw it when I finished it up. He is the worst surprise-giver, secret-keeper ever. Mother's Day this year wound up being a day early, because he couldn't hold in the surprise of what he had made for me with his dad. I figured if I didn't hurry up and give my gift to Cindy, he was totally going to spill the beans, so this year, she got her present a bit early. Cindy is in the process of writing a book of her own, so I wanted to give her a shelf with her own book on it. She and I both love the art of writing, and I'm so excited for her and proud of her writing so far. I know that she will finish this book and it will be on shelves one day, and I can't wait to see that day come. So, in an effort to keep her inspired and show her how much I believe in her, I decided to make her a bookshelf miniquilt, using her favorite color green, along with some blues for accent and contrast. "Words, once they are written, have a life of their own." I love that!! When I found it, I knew it was a quote she would appreciate, and I really enjoyed stitching it on here for her. I just wish I'd used a darker embroidery thread!! It's a bit easier to read in person, I swear! Cindy was super excited when I gave her this mini, which made me super happy. She's going to hang it in the room where she does her writing, which is super perfect. ETA - If you love this mini and haven't seen it before, I wrote a tutorial on how to make one of your own a while back, which you can find right here.